SharedObject is a feature that give Flash Player the ability to save data locally to be used later in your application, roughly speaking is like a cookie. With Flash Media Server, was introduced the possibility of using the SharedObject Remote, in which the data is saved in Flash Media Server and shared for all instances of a connection between Flash Player and Flash Media Server. This enables you to create applications in real time as Dashboard, chats and whatever else your imagination allows. 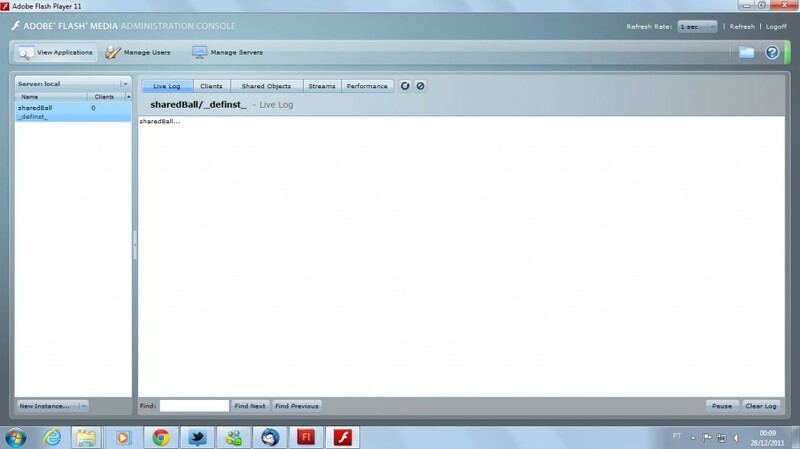 The SharedObject Remote can be used in two ways in conjunction with Adobe Flash Media Server. If you have no knowledge to use the language of the Server-side Flash Media Server, you can use the SharedObject Remote only by ActionScript 3.0. Let’s sharedBall a classic example, where the goal is to share the positions of the ball to update the other clients connected to the same instance. Let’s test this file, open the Flash Media Server console, usually located in the installation directory / webrrot / swfs. You can open the browser or the swf directly. With the connection made, we can instantiate our Remote SharedObject to share the x and y positions of the ball.